Take a shot…of dessert. This delicious treat will surely satisfy your sweet tooth for only 35 calories a pop. Bottoms up! Stuff each raspberry with 1  chocolate chip and set aside. Add a few squirts of aerated whipped cream into each shot glass and sprinkle unsweetened cocoa powder on top. 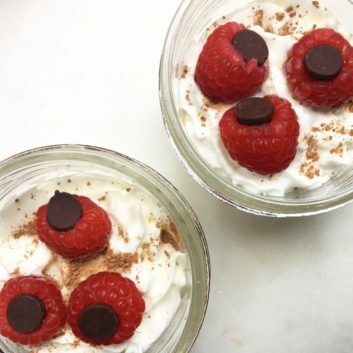 Place chocolate-stuffed raspberries on top of each glass and enjoy.